Prime Minister Justin Trudeau and President Donald Trump would have to somehow "un-suspend" the old Canada-U.S. free trade agreement. WASHINGTON — It's a refrain frequently heard in Canada: That ending NAFTA wouldn't change much in economic relations with the United States, because the countries could simply pull their older agreement off the shelf, dust it off, and persist in trade without tariffs. It's also wrong, some analysts say. A few people interviewed this week disputed the idea that the original Canada-U.S. Free Trade Agreement of 1987 would automatically snap back into place if NAFTAdisappears, an increasingly relevant topic as hostilities mount in the trilateral trade talks. 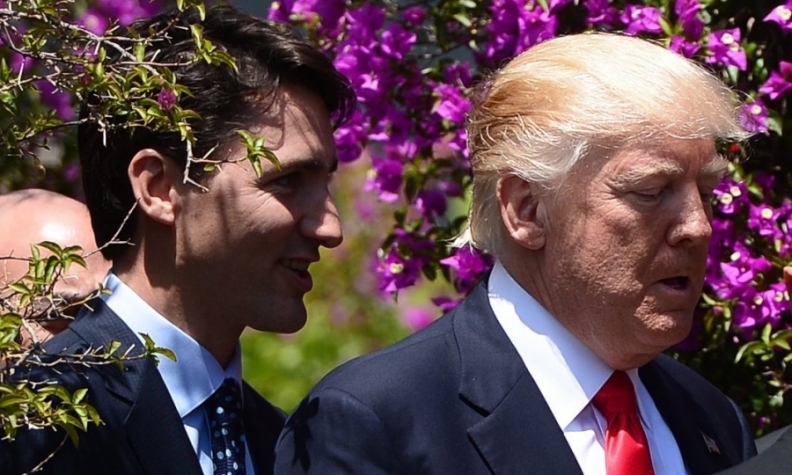 "That's so naive," said Sarah Goldfeder, a former U.S. diplomat in Mexico and Canada who is following the trade negotiations at Earnscliffe Strategy Group in Ottawa, on the idea of an automatic snap-back. "You'd have to re-implement (the original agreement)." That would raise new challenges, she said. First of all, she said the current American political climate would not make for an easy re-implementation. She said there would be demands for a renegotiation within the U.S., and the parties would soon be back at the table struggling with many of the same sticking points. "There's no way this (Trump) administration would do this (re-implementation) without negotiating a new agreement," she said. "So you're still going to have to negotiate all the same irritants." The current talks have become bogged down amid huge gaps between the countries — and not only in material things like dairy, automobiles, and public works' Buy American rules, but in basic philosophical differences on the architecture of a trade deal. The Trump administration's proposals would make it easy to cancel the agreement within five years, and hard for countries to count on stable long-term access to each other's markets. The president says he'll cancel NAFTA if he can't get a deal. Insiders now view termination as a real possibility, raising unprecedented procedural questions — like what the rules are for cancelling a trade deal and, of particular importance to Canadians, what the rules are for reviving an old one. The suspension of the old agreement was signalled in diplomatic notes exchanged between the countries. The 1993 notes were brief and vaguely worded. The countries complimented each other on their new deal with Mexico, and confirmed that each would make separate arrangements to suspend the old deal. The American suspension is laid out in Section 107 of the law implementing NAFTA in that country in 1994. The earlier deal negotiated by Brian Mulroney and Ronald Reagan was to be suspended, and, according to the law, it would remain suspended until such time as that suspension might be "terminated." It doesn't define how you "terminate" a suspension. But a trade consultant who two decades ago advised Canada's parliamentary committee on NAFTA implementation said it obviously requires someone to do something. "It's been suspended. Somebody has to un-suspend it," Peter Clark said. That someone could be Congress. And even if Congress does successfully vote to re-introduce the old FTA, its vote would either require the approval of President Donald Trump, or an overwhelming, two-thirds majority vote in Congress to overcome a presidential veto. A Washington trade expert says lawmakers could also try sneaking bits of trade legislation into larger bills — it's a common practice in American lawmaking to tack on unrelated items to a bill. But Eric Miller says his own congressional sources have already told him: American lawmakers would expect a vote on any FTA re-implementation. He's warning Canadians now — over what he calls a dangerous complacency that there's some insurance policy if NAFTA dies. "I think it's highly questionable that this insurance policy will pay out, and pay out in full, in the case of an accident," he said. "I'm highly doubtful the agreement would come back into place and everyone would be fine with it... If Congress believes they're going to have to vote on it, then they're going to have to vote on it." The U.S. Constitution, after all, gives Congress the power over international commercial agreements. Historically, Congress has merely lent that power to the president, and worked out a compromise set of rules known as fast-track legislation. Now some analysts suggest the Congress could try wresting back its rightful power, block any Trump effort to cancel NAFTA, and avoid all this uncertainty over the 1993 deal, the 1987 deal, and trade in general. But a former U.S. trade czar expresses some doubt this will happen. Barack Obama's trade representative Michael Froman points to the track record of this current Congress — which has failed to pass a single piece of policy legislation of any significance. "I think it would require a lot of action, a lot of consensus in Congress. And that may emerge," Froman told the Council on Foreign Relations this week. "But so far, there haven't been a lot of profiles in courage." The end of free trade in North America would leave new tariffs averaging 3.5 per cent in the U.S., 4.2 in Canada, and 7.1 in Mexico. Some analysts say that would reduce Canada's GDP by about 2.5 per cent on a long-term basis.